Many believe the terms "cooktop" and "rangetop" are interchangeable, when in reality they are two different things. A cooktop is a smaller appliance on your countertop, available in electric or gas models, with controls built into a surface. A rangetop is a deeper unit with front positioned controls and powered by gas. 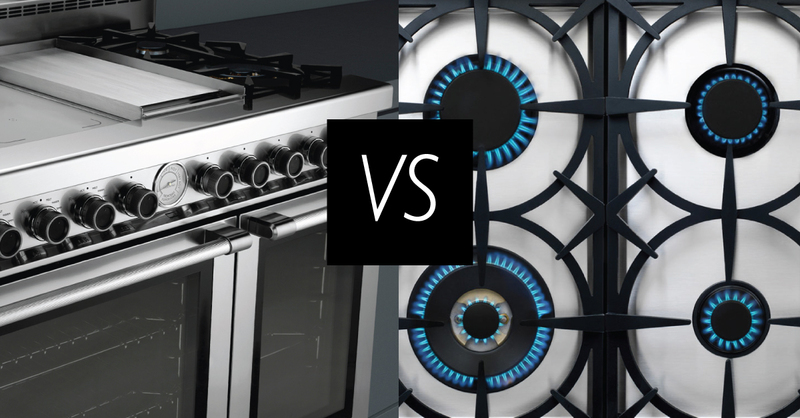 Cooktops and rangetops are stand-alone appliances - they do not offer a full oven underneath. For those who already have a freestanding or built-in wall oven, a cooktop or rangetop are an excellent addition to offer more versatility in the kitchen while cooking. While TOP has yet to introduce cooktops and rangetops to the North American market, we do carry some models in our European line. UPPER ranges provide the versatility of a cooktop or rangetop with the convenience of an oven built underneath. Range appliances are an excellent option for those looking to master the art of cooking in only one appliance. Our range offers maximum convenience TriFuel® for those looking for a quality professional cooking experience right in their home. With four powerful induction zones, the precise electric griddle and 2 brass gas burners, this range worktop offers multiple cooking options without sacrificing on style and performance. The worktop also sits atop two gas ovens equipped with two convection fans and broilers (main cavity). Our NEXT 48" range is the ultimate cooking companion to achieve maximum versatility, designed for real life.